I am fairly certain that in college my body was 50% cheap beer. Between marathon sessions of studying and partying alike I wish I would have paid more attention to my water intake. Health authorities recommend eight, eight ounce glasses of water a day. Since drinking alcohol can severely dehydrate drinking at least a glass of water between each beverage will help lessen the hangover factor. Plus you won't act like such a slob. Win/Win. Being a college student at San Diego State meant many, many beach days. We studied at the beach, partied at the beach, heck there was even some classes at the beach! My friends and I were always lusting after golden skin and sun kissed hair. While the goal was to get as tan as possible, that also meant exposing our skin to harmful UV rays.With cancer sadly not going away anytime soon, we should all be as proactive as possible to prevent it. Applying sunscreen before sun exposure of at least 50 SPF is a pretty easy solution. Speaking of protecting your skin, I wish I had done better at taking care of mine. Having a nighttime routine is beneficial at any age but starting when your skin is youthful is beneficial. Always wash your face before bed and moisturize (with an SPF lotion!) if anything. It may help keep away the crows feet a little longer and the zits at bay. Luckily this is something I have always done (thanks dad!) but one thing that goes with you long after college (well I guess that could be a lot of things - gross!) is your credit score. Make sure to always pay your bills on time and keep your credit score as high as possible. Once you ding that bad boy it is much harder to get it back up again. And when it comes time to apply for a car or put a down payment on a house those three little numbers will carry a lot of weight. Long before Justin Beiber sang those lyrics I wish I had appreciated them a little more. Living in San Diego meant I was constantly surrounded by beautiful people. I should have realized more often than not that I was one of them. We can get so wrapped up in everything we are not we forget to love everything that we are. "And I never like to admit that I was wrong" but oh was I wrong about that one. 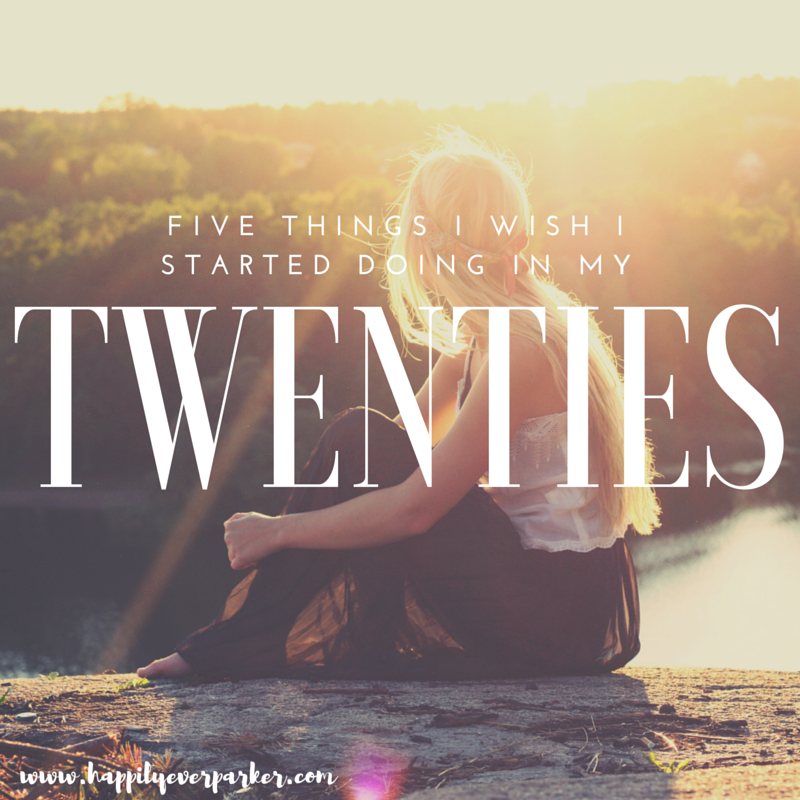 What is something you wish you started doing in your twenties? I wish I worked out more during college, there just wasn't enough time in the day but seriously how good you feel when you're done right?! Amen to all of this! Especially the water and sunscreen part! What a great post! Yes, yes, yes to the loving yourself part! I was always comparing myself to others when I should have just felt comfortable and confident in my own skin!! What I didn't realize is that people were probably comparing themselves to me! It took well into my late 20s (and kids!) before I finally developed a strong sense of self, and now, I really couldn't be happier! Yes to all of these, particularly that last one. I still struggle with that. Isn't this the truth!! I'm forcing myself to finally be more careful with my skin. I'm. It getting any younger so anything I can do to help myself is great! Ughhhh why didn't I start wearing sunscreen sooner?! I'm not sure why I loved the tan look so much in my teenage years! Yes to all of these!!! I'm still working on the hydrating part... it's a daily struggle. I just get so caught up and completely forget to drink the water that's sitting on my desk! I find that my twenties (sadly almost over!) are a time of transition. It's the decade I got married in, bought a house in, and really became an adult in. It was a steep learning curve and all of your tips are very useful. Especially the last one! Amen sister! I need to drink wayyy more water and wish this was a habit already! Love what you said about living in SD. I did too and felt the same way! My mother has always been so depressed about aging, I actually started using anti aging products at age 20! I think the headstart definitely helped. Oh man, what an awesome post friend - and so honest! I had to do a little reality check... I never drank water, never ever! And now i am trying my best to train myself to keep hydrated all day! And loving myself?? Haha, wish I had done that too!